Political groups in Pakistan’s Balochistan province have called a three-day general strike in protest at the killing of three ethnic leaders. One policeman died in riots on Thursday and more trouble is feared. The United Nations expressed “serious concern” over the killings and urged an immediate investigation. Supporters say the three men went missing after being detained by security forces. An army spokesman blamed “anti-state elements”. Reports from the provincial capital, Quetta, suggest the strike is being widely observed, with shops and schools closed and little traffic on the streets. The BBC’s Barbara Plett in Islamabad says the discovery of the bodies has torn the lid off a simmering conflict. Baloch nationalists have long campaigned for greater autonomy and control of local resources. An armed insurgency is demanding outright independence. It is feared protests and riots will continue across Balochistan on Friday and over the weekend. The government has already shut educational institutions in the province, while lawyers are boycotting courts in protest. The victims were members of the committee that was recently formed by the government of Pakistan to investigate the case of missing persons in the province, notably abducted UN worker John Solecki, who was freed last Saturday. The three leaders killed were named as Ghullam Muhammad Baloch, Lala Munir Baloch and Sher Muhammad Bugti. Prime Minister Yusuf Raza Gilani has condemned the killings, calling them an attempt to sabotage reconciliation efforts. A lawyer and former opposition leader in the province, Kachkol Ali, said that the three were picked up by members of a security agency from his chambers in Turbat last Friday. Their decomposed bodies were found late on Wednesday night near Turbat. Apparently they had been killed more than two days previously. The BBC’s M Ilyas Khan in Islamabad says the statement by the army spokesman is highly unusual. It terms the murders “regrettable” and blames “anti state elements… out to destabilise and undermine the reconciliatory efforts of the government”. The spokesman said it was “unfortunate and not in the interest of the country to make serious allegations against security agencies without knowing the facts and evidence”. Our correspondent says the army’s internal intelligence wing, the Military Intelligence, is widely held responsible by many people in Balochistan for “disappearances” of political activists this century. Many of them have been killed or maimed by torture. 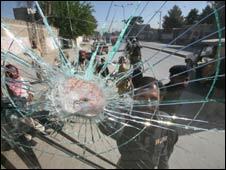 On Thursday a policeman was killed by protesters’ gunfire in the town of Khuzdar. A number of banks and offices were set on fire. British Prime Minister Gordon Brown has asked President Asif Ali Zardari [Images] to do more to root out terrorism emanating from Pakistan’s territory after police in the UK arrested a dozen Al-Qaeda [Images] suspects, including 11 Pakistanis, over a “very big terrorist plot”. Presidential spokesman Farhatullah Babar said in Islamabad [Images], without giving details. However, Dawn newspaper reported that Brown raised concerns about links between terrorists in the UK and Pakistan and demanded ‘intensified efforts to crush militants’. The telephonic conversation between Brown and Zardari follow resignation of the UK’s top counter-terrorism expert Bob Quick after a security blunder by the police officer, who inadvertently disclosed a covert surveillance operation against Al-Qaeda suspects, forcing premature raids by police who arrested 12 suspects, including 11 Pakistanis. ‘One of the lessons we have learnt is that Pakistan has to do more to root out terrorist elements in its country,’ Brown told Sky News. Brown said the British police raids on Wednesday targeted those behind “a very big terrorist plot”, which authorities “have been following for some time”. The cell was believed to have been planning to carry out attacks during the Easter holidays. Brown also sought Pakistan’s help in probing the terrorist plot — in which the 12th suspect arrested was a Briton with roots in the tribal areas while the 11 Pakistanis were in the UK on student visas. British media reported that the mastermind of the terrorist cell was believed to have been Rashid Rauf, an Al-Qaeda suspect who was implicated in several other plots. He was reportedly killed in a US drone attack in Pakistan last year. Al-Qaeda operatives in the Pakistan-Afghanistan border region were highlighted as one of the major security threats confronting Britain in its government’s counter-terrorism strategy published last month. Spokesman Babar said Brown and Zardari also discussed US drone attacks in Pakistan’s tribal areas and the fragile peace deal in the restive Swat valley. They also agreed to meet soon, he said. KANDAHAR, Afghanistan (AFP) — A suicide bomber killed a child and four anti-drugs policemen in southern Afghanistan on Thursday, police said, as the US military reported killing 10 militants in overnight raids. The blast occurred in the town of Lashkar Gah, capital of the turbulent southern province of Helmand, the heart of Afghanistan’s opium production — a lucrative trade that helps bankroll a Taliban-led insurgency. A man walked up to a four-vehicle police convoy and detonated explosives strapped to his body, deputy provincial police chief Kamaludin Khan told AFP. Four counter-narcotics policemen and a nine-year-old child were killed, while seven policemen and two civilians were wounded, Khan said. The policemen were heading out to eradicate opium fields south of the town, he said. Khan blamed the attack on “enemies of Afghanistan”, a term often used to refer to Taliban militants who are waging a bloody insurgency that profits from the huge opium and heroin industry. Afghanistan produces 90 percent of the world’s opium, most of it coming from Helmand, where some of it is also manufactured into heroin in drugs labs. The 1996-2001 Taliban government was able to radically cut back Afghanistan’s opium production but the insurgents now earn millions of dollars a year from the trade, officials say. They take a “tax” from opium farmers and also earn money from protecting trafficking routes and fields, using the cash to buy weapons for their insurgency, according to Afghan and Western officials. Part of an international effort to stabilise Afghanistan and rid it of extremists linked to Al-Qaeda in neighbouring Pakistan is a costly effort to tackle the drugs trade, which also feeds government corruption. The Taliban swept to power in 1996 and were removed five years later in a US-led invasion after they did not hand over their Al-Qaeda allies following the September 11, 2001 attacks. The militants rose from Kandahar province, which is still one of their strongholds. The US military said that Afghan and international troops raided a Taliban cell in the province’s Maiwand district overnight and killed six militants. The cell was involved in attacks against Afghan soldiers and their international counterparts, it said. A separate US military statement said four militants, one of them a woman carrying weapons, were killed in the eastern province of Khost in another overnight operation. The raid targeted the Haqqani network and a separate outfit called the Islamic Jihad Union, it said. The Haqqani group falls under well-known Soviet resistance commander Jalaluddin Haqqani, who is believed to be close to the fugitive Tailban leader Mullah Mohammad Omar and Al-Qaeda. Haqqani’s sons are said to have taken over militant activities from their now elderly father. The Islamic Jihad Union is also linked to Al-Qaeda. There was no independent confirmation that the dead were all militants. Last year was the deadliest of the Taliban-led insurgency, associated with extremist violence also picking up across the border in Pakistan. US President Barack Obama has launched a new sweeping strategy to combat the mounting threat from extremists and turn around the insurgency in Afghanistan, including a focus on eliminating Al-Qaeda bases in Pakistan. ISLAMABAD: Pakistan has already lost sufficient chunk of foreign/ domestic investment and business activities due to rising phenomenon of terrorism and bomb blasts forcing many investors and businessmen to look for safe destination for investment. Due to this factor businessmen have always been clamouring for improving law and order situation enabling them to promote business and economic activities smoothly but the current fresh and vigorous wave of bomb blasts, killings of innocent citizens and the security personnel and the hair-raising incident of the flogging of a teenage girl in Swat publicly have created new waves of concerns in traders and industrialists. This was observed by Mian Shaukat Masud, President, Islamabad Chamber of Commerce and Industry in a meeting of local business community at ICCI, called to discuss these matters. The businessmen said that such agonizing incidents will act as a demoralizing factor for prospective investors who will desist from considering Pakistan for investment ventures. They said Pakistan’s economy will be the biggest loser from these inhuman and ghastly acts which no religion in the world allows. In the past few days more than 150 people have lost their lives in the gory bomb blasts in different parts of the country. The siege of Manawan Police Training Centre; suicide blast at a crowded mosque in Bajaur during Friday prayers last month; suicide attack at the entrance of Special Branch of Police at Sitara Market, Islamabad; Saturday’s attack on FC Islamabad and Sunday’s bomb blast at an Imambargah in Chakwal, near Rawalpindi will send disappointing signals to entrepreneurs and investors throughout the world providing more supporting material to foreign emissaries to advise investors and people against visiting Pakistan. Mian Shaukat Masud said already trade and industry is struggling for its survival due to many unfavorable factors while deteriorating law and order situation will make conditions worst for them. He said if this trend continued, businessmen will be plunged into deep troubles as they will not be able to do business in such environment where they would always be worried about their life and property. He called upon the government to take all possible measures and equip security apparatus with better technology, equipment and tools to forestall such incidents effectively and control the elements that have expedited their nasty agenda of creating anarchy, bloodshed and frustration in the country in connivance with foreign elements. THERE were nearly 3,200 terrorist attacks worldwide last year, the Bush Administration said yesterday, using a broader definition that increased fivefold the number of incidents that Washington had previously tallied for 2004. In figures published in April, the US State Department said that there were 651 significant international terror incidents, with more than 9,000 victims. But under the newer, less-stringent definition of terrorism, which counts domestic attacks without an international element, the National Counterterrorism Centre (NCTC) reported 3,192 attacks worldwide, with 28,433 people killed, wounded or kidnapped. Iraq, with 866, had the most attacks against civilians and other non-combatants, according to the report. Under the April figures, Iraq was considered to have suffered 201 attacks in 2004. The new tally included attacks on Iraqis by Iraqis, a category previously excluded because it was not considered international terrorism. But attacks against coalition forces were omitted, because soldiers are considered combatants. Insurgent attacks on Iraqi police, deemed non-combatants, were included. The Bush Administration’s terrorism figures have been the subject of repeated controversies. Last year the State Department withdrew its annual report on global terrorism after claiming that terrorism incidents had been declining for three years and that 190 cases reported in 2003 represented the lowest total since 1969. American officials trumpeted the report as evidence that the US was winning the War on Terror. But the document was found to be full of errors, and officials acknowledged that it had vastly understated the number of attacks. This year the State Department decided not to publish the terrorism figures in its annual report. It handed the responsibility to the new NCTC. John Brennan, its interim director, said that the methodology that produced the April statistics was so flawed that the numbers were unreliable. For example, when Chechen rebels blew up two airliners over Russia in near- simultaneous attacks last year, only one attack was counted under the old system. On board one aircraft were 46 Russians. The other had 43 Russians and one Israeli civilian, a foreign citizen. That allowed only the second attack to meet the criteria for international terrorism, which under the old system required terrorists to claim at least one citizen from another country among their victims. According to the NCTC figures, America suffered only five terrorism incidents last year, which included an arson attack in Utah for which the Animal Liberation Front claimed responsibility. Mr Brennan said that the low number of attacks on US soil reflected the good job that the Bush Administration has done in protecting the US homeland. But he noted that many attacks overseas are aimed at American and Western interests. According to the report, only 19 per cent of terrorist incidents last year were attributable to Islamic extremists. A quarter were recorded as secular or political attacks, but it said that the motives for 56 per cent remain unknown. Asked how the NCTC distinguishes between freedom fighters and terrorists, Mr Brennan said that the centre’s database is not “black and white and perfect”. THE UNPRECEDENTED terrorist attacks by air in New York and Washington have opened a new phase in the history of mankind and President Bush has already declared it as the “first war of the 21st century.” For many in India, it is a grim reminder of the 1993 serial blasts in Mumbai though not comparable on any tragic scale to what happened in New York and Washington. The real significance of Black Tuesday (September 11) is that it is almost sure to shock the U.S. into treating terrorism as its overriding security concern. The U.S. might take a vow to wipe off terrorism from this planet but even a casual look at the economics of such criminal activities makes it an impossible task. Though most countries might make a mistake of believing it as a plain or politically/ideologically motivated criminal activity the actual truth comes to the surface only when we take a closer look at the economics. It is certainly not a war between nations, religions or classes or even civilisations, as Prof. Samuel Huntington would like us to believe. It is fundamentally a broad conflict that puts the moderate against the extremist. The job of fighting terrorism cannot be separated from the task of preventing, containing and ending conflicts. All too often the places that generate terrorism as well as drug-trafficking, health epidemics, refugees, outflows and environmental disasters are shattered societies where hunger, greed, repression and poverty have fed violence, despair and extremism. “Organised crime” will be a defining issue of the 21st century as the cold war was that of the 20th century and colonialism that of the 19th century. Transnational crime will proliferate because crime groups are the major beneficiaries of globalisation. The global drug industry alone now accounts for 2 per cent of the world economy and it is constantly rising. According to a 1999 World Bank report, the smuggling trade between Taliban-controlled Afghanistan and Pakistan was worth more than $2.5 billions in 1997. If smuggling from other neighbouring nations is included in this network, the turnover could easily cross $5 billions most of it is in narcotics and its related ingredients like various chemicals which go for refining heroin. There is a close nexus between Taliban and Pakistan in drug- trafficking. According to the U.N. Drug Control Programme, Afghanistan produced 4,600 metric tons of opium in 1999 — three times more opium than what is produced elsewhere in the world. This opium is processed in refining factories in Pakistan before being sent to Lagos en route to Europe and America. It is this drug money, running into several millions of dollars, that fuels terrorism, funds networks across the world and makes possible missions like the WTC air attack. But drugs may not be the largest part of the global mafia’s business. Mafia related stock-frauds use offshore corporations through various hideouts in the international system to manipulate the stock market. There are around 50 “states” in the world, e.g. Bahamas, the Pacific island of Nauru, Yugoslavia and the Republic of Montenegro, that exist largely by selling their national sovereignty to those who wish to buy it in order to make their business deals inconspicuous. The “state” of Dominia advertises itself on the World Wide Web — its passport can be bought in a package with a name change, under the slogan “Perfect for someone who would like to leave his past behind”. There is no secret as to what these states do; but since they have the formal attributes of independent states, they cannot simply be closed down. Internationalisation of criminal activities induces organised crime in different countries to establish strategic alliances to cooperate, rather than fight, on each other’s turf, through subcontracting arrangements and joint ventures, whose business practice closely follows the organisational logic of what Manuel Castells, of the fame of The Rise of Network Society, has characterised as “the network enterprise”, the characteristic of the Information Age. Furthermore, the bulk of the proceedings of these activities are by definition globalised through their laundering via global financial markets. Estimates of profits and financial flows originate in the criminal economy very wildly and are not fully reliable. Yet they are indicative of the phenomenon. The 1994 United Nations Conference on Global Organised Crime estimated that global trade in drugs amounted to about $500 billions a year; that is, it was larger than the global trade in oil. Overall profits from all kinds of illegal activities were put as high as US$1 trillion a year in 1993, which was about the same size as the U.S. federal budget at that time. Sterling considers plausible the figure of $500 billions as the likely global turnover of “narco-dollars.” In 1999, the IMF ventured a very broad estimate of global money laundering in a range between 500 billion and 1.5 trillion dollars a year (or 5 per cent of global GDP). First, to monitor and timely warn the government bodies concerned, and law-enforcement agencies regarding terrorist threats; second, to receive and store all lawfully collected relevant information from any government agency including law- enforcement, phone tapping and judicial information; third, to protect established civil liberty of citizens; fourth, to produce integrated reports that could be disseminated to any agency needing them: finally to suggest ways for counter-terrorism intelligence, including bilateral efforts of individual agency. In short, the Bureau would combine the active intelligence gathering approach of the national security agencies, which are not legally constrained in their foreign investigations, with the domestic authority and investigative resources of law enforcement agencies. In devising strategies to fight the terrorists and terrorism, it would surely be useful to minutely observe and understand the forces that drive them. Poverty (illiteracy) amid plenty is one of the greatest challenges and the breeding grounds for terrorism. According to the World Development Report 2000-2001, “at the start of new century, poverty remains a global problem of huge proportions. Of the world’s 6 billion people, 2.8 billion live on less than $2 a day, and 1.2 billion on less than $1 a day. Six infants of every 100 do not see their first birthday, and 8 do not survive to their fifth. Of those who do reach school age, 9 boys in 100, and 14 girls, do not go to primary school.” Similarly, technical hegemony is creating a new map of the world. A small part of the globe, accounting for some 15 per cent of the earth’s population, provides nearly all of the world’s technology innovations. A second part, involving perhaps half of the world’s population, is able to adopt these technologies in production and consumption. The remaining part, covering around a third of the world’s population, is technologically disconnected, neither innovating at home nor adopting foreign technologies. Thus, a concerted attack on poverty and technology diffusion on a large scale will go a long way to contain terrorism and it will dry up the ideological base which sustain the terrorists and terrorism. Lecturing poor countries about weak governance, while providing precious little money for technological advance, public health and other needs, is mere rhetoric which will not work. Quarrels over ideology have ended. The prosperity of the richest countries is at an all-time high, and so is their capacity to look beyond their own immediate needs. At the same time, the crisis of the poorest countries is acute, and the shortcomings of the current strategy of globalisation painfully evident. Much of the poorer world is in turmoil, caught in a vicious circle of disease, poverty and political instability. Large-scale financial and scientific help from the rich nations is an investment worth- making, not only for humanitarian reasons, but also because even remote countries in turmoil become outposts of disorder for the rest of the world, as has been happening in Afghanistan, Pakistan and Sudan. During the cold war, the U.S. and its allies invested trillions of dollars to stop the spread of communism. Now, a similar amount should be spent for wiping out terrorism from the globe and the generous aid could facilitate the poor, backward countries in integrating into a global economic network. Needless to say that at present America’s foreign aid is just 0.1 per cent of its GDP, a derisory shadow of what it used to be. In 1969 the Pearson Commission recommended that donor countries give 0.7 per cent of their gross national product in official development assistance (ODA). The total gap in international development cooperation is close to $100 billions a year, precisely the amount that would be available if the appropriate ODA, according to the 0.7 per cent target, were met. The challenge is to persuade the industrial countries that aid expenditure to build a more secure world is a vital investment and certainly more efficacious than military expenditures. Following America’s lead, most of the large and developed economies have allowed their own foreign-assistance programmes to shrink since the end of the cold war. Even when the United States reaped a peace dividend of more than 2 per cent of GDP by reducing its defence spending after 1990, it cut, rather than increased, foreign-assistance spending as a share of its national income. The need of the hour is that American administration should pledge to raise foreign assistance to at least 0.3 per cent of the GDP. This would not only bring the world’s richest country back in line with the average aid proportion of other donor nations, but would make available an extra $20 billions a year to invest in economic development. Such a turnaround in America’s role could harness much larger contributions from the European Union, Japan, and other potential donors (both public and private). This increase in foreign assistance by donors would have a positive impact in a serious attempt to contain terrorism as well as break the nexus of illegal economic activities and terrorism at global scale and will foster social capital, civil society and development.